After becoming increasingly frustrated with Windows Vista, I began searching for an alternative operating system. An “upgrade” to Windows XP seemed like the only other option, but Skatter Tech’s senior editor, Sahas Katta, suggested I try Ubuntu 9.10: Karmic Koala. Naturally, after years and years of using Windows based systems, I hesitated to install Ubuntu. First off, I did not like using Linux. I never got into the habit of learning all the different commands and functions of a Linux OS and did not want to start now. I believed in this stereotype that only very tech-savvy computer engineers used anything Linux related. 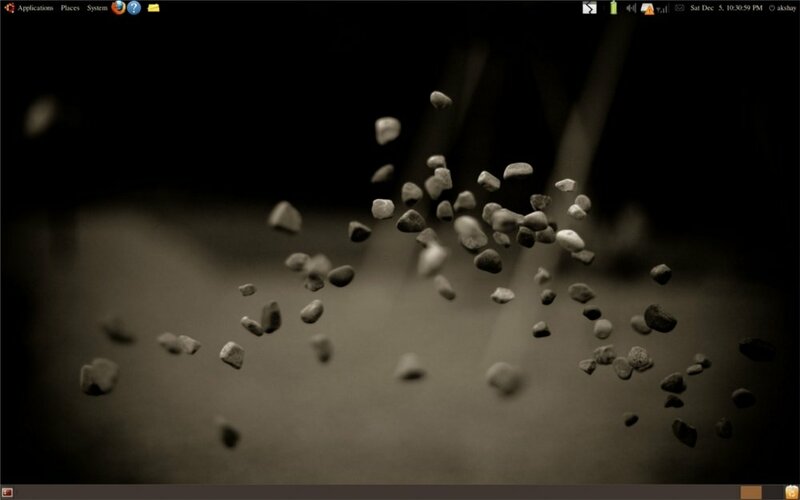 Therefore, I winced after Sahas suggestion as I knew that Ubuntu was built on the open source Linux kernel. But alas, Vista drove me nuts and I became fed up. Finally, I weighed my options: I could either go back to Windows XP (older, but I know it worked) or try out the free, open source Ubuntu OS (new, but mysterious). So I figured, what’s the worst that can happen if I try Ubuntu? Right off the bat, Ubuntu earned my respect. Installing the entire OS, after deleting and creating new partitions, on my less-than-average HP dv5z took less than 20 minutes. (Side note- the HP dv5z disappoints me greatly. I do not recommend this slow, unstable, and easily-overheating laptop to anyone. I hope the new laptops in this series fare better than this.) I thought it would take a painful hour or more, so finishing the installation in this amount of time pleased me. After downloading all the necessary updates for the system, which went by pretty quickly, I restarted my computer (Ubuntu booted up in about 20 seconds), took a deep breath, and dove in. The simple layout of the desktop and destinations make using this system fairly easy. 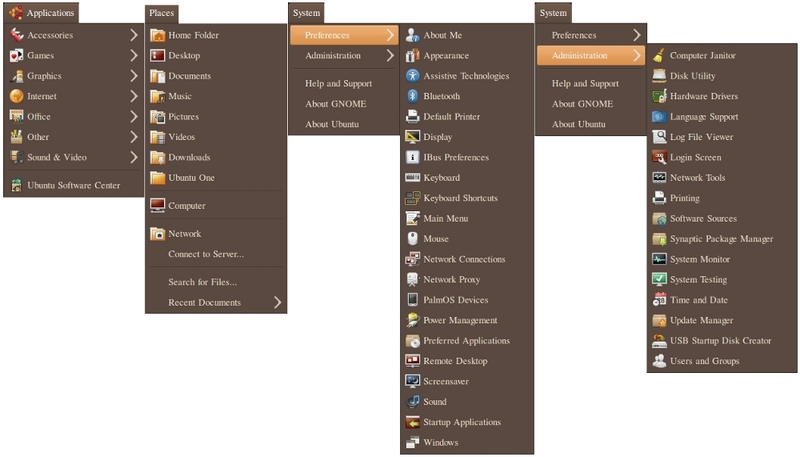 The three tabs at the top—Applications, Places, and System—are the Ubuntu equivalent of the Windows Start, Explorer, and Control Panel functions. However, Ubuntu organizes all the files, folders, and programs better. For example, in Ubuntu, if I want to open up the mouse preferences, I simply go to System, then from the drop-down menu hover over “Administration”, and then click on the “Mouse” preferences. In the cluttered Windows XP & Vista, I click on the Start Menu, then on the Control Panel. I then have to browse through the control panel in search for the Mouse preferences item. That once again opens up another window. With Ubuntu, only one window opened up, the Mouse preferences, unlike Windows where I had several already. Everything feels faster to do too. And like I said above, I can click on any file or program up in this fashion and do it quickly and cleanly. Also, as an alternative and supplement for Linux users, Ubuntu features a console and similar Linux programs. In addition, I enjoyed toying around with the highly customizable user interface. One of my favorite features, I get to change almost every aspect of the desktop. I can add new panels (a.k.a. taskbars) and place folders or programs on them. In addition to changing to the provided theme, I can make a completely new one, with my own color, image, and font scheme. Other than the desktop, the animation effects increased the fun and cool factor using the OS. By downloading free software called Compiz, I am able to use many different effects including making my windows wobble, opening/closing files using a “magic lamp” animation, or starting a really big multicolored fire on my screen. A user can spend hours customizing by just using Compiz: the possibilities are endless. While some of those features are definitely gimmicks, others truly help with productivity. Continuing on the idea of possibilities, by going to the Ubuntu Software Center, I have the ability to download al most any open-source program or software for free. There are many alternatives to replace programs on Windows or Mac. A few main stream ones, such as Mozilla Firefox or the VLC Media player, can already run on Ubuntu. Others, such as Adobe Photoshop, cannot, but Ubuntu remedied this problem by finding a somewhat comparable alternative to download, in this case, Gimp. I found every program that I used on Windows, whether it be the Linux version or an alternative one through the Ubuntu Software Center. Even if I did not like the comparable Ubuntu software or if I run into issues, there’s plenty of new applications being added by developers from all over the world and a huge community to offer support. As great as Ubuntu runs, there are a couple problems that cannot be overlooked. For one, the wireless connectivity, at least for me, works poorly. More often than not, I cannot connect to a network. If I do end up connecting, the connection to that network frequently drops. Although a solution to this problem most likely exists, it is nonetheless still an annoyance. But again, this only happens with a few of my connections, not all of them. (It could also be an issue with my HP hardware.) Another issue I can now overlook, but probably will come up again concerns the use of software. Although alternative software remedies this issue, it does not solve it. If a new updates hits the internet, I am unable to use it because it will most likely only run on Windows and Mac. Also, popular PC games, such as Call of Duty or Halo, can’t run on Ubuntu. Fortunately, I mostly play on consoles, so this did not bother me greatly. Also, though I have yet to download any, Ubuntu advertises over 400 free online games of all genres. 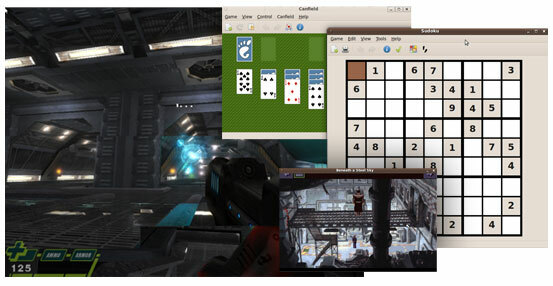 In case of Call of Duty you should try installing Wine, or PlayOnLinux from your Ubuntu SoftwareCenter. Buth are Windows emulators that make Windows programs run on your Ubuntu box. I believe you can run Adobe Photoshop that way too. Give it a try, you’ll be amazed about tohse emulaters. I run Return to Castle Wolfenstein trough Wine myself, and it works beautifully. I don’t want to be nitpicking, but wine is really not an emulator. Saying that makes people think the games will definately run slower than under real windows. Usually they run faster. They technically correct term would be “windows compatibility layer”. What it does is redirecting all the windows function calls to their linux counterparts if there are any. If not the wine guys replicated the functions. To say it plainly: they reverse-engineered all the stuff needed to run windows apps (and games) so that they can run NATIVELY. Yeah… the acronym is- WINE: WINE Is Not an Emulator. Akshay, for your wireless situation, download and install wicd. It is far more likely to give you rock solid wireless connections than the Network Manager app that ships with Ubuntu. I also had this problem on my HP laptop until I did this. Since then, no problems with wireless at all. Thank you for your advice David, I’ll be sure to give that a shot today! There is a control center in Ubuntu, which in my opinion is much better that the “system” and “preferences” dialog. Check out my guide if you’re interested! I second David. The NetworkManager is really flaky on some systems. Give Kubuntu a try, you will be much more impressed and enchanted. Kubuntu is a variant of Ubuntu but based on KDE. Please let us know what you think. Nice review, also do not forget to give Ubuntu One a try. Ubuntu one will allow you to sync your files online, so you can access or share files from other machines when you are on the go. Commit a bit more and that’s a new (free: free as freedom) world opening to you. You will ditch Windoze for good. Linux-Ubuntu turns on my BEST machines. Linux-Ubuntu is not the OS of the poor as too many people might thing. You get the best of it when you master the Linux/Unix commands. You can get a free secure server in no time. Linux-Ubuntu is GNOME, I disagree with a previous comments. The KDE flavor is ugly and a Windoze like for Linux. KDE – it’s a GUI – is the default GUI for Linux-SUSE. Linux-SUSE is in the hand of Microsoft, they eat the same bread. They use Mono applications – Mono is a language. Boycott Mono application and Boycott Novel (Suse). Kubuntu is KDE and KDE in my view is ugly and bloated. GNOME the default Linux-Ubuntu is way better and neater. It is simple and elegant as you state it in your blog. Linux: no need to defragment. no need anti-virus, no need anti-spyware, no registry with locked keys to edit, the applications share libraries, no need to download huge .ex files, no 200 MB security patches to upload every week, no services packs etc. no need to image the full system, you re-install in 30 min. The OS does not take 15 GO!!!! Windoze is a joke. Windoze is only a cow milk in the hand of a marketing department. Apple is a rotten fruit, looks good? the Third Reich looked good too, that’s the same spirit. Locked down machine, no compatiblity, no feedoom, no choice. Apple is a dictatorship in the marketing department. You like the look? Well, get you boots and black cap, they’ll match. By chance there is Linux. There is no fuss. People use it, write software, submit bugs, commit. And yes, the software are free and better. Almost everything will get you the job done. This post is hilarious. Man, some people. anyway.. It is great Linux/Ubuntu has no need for anti-whatever although in general the updates for Ubuntu are a lot larger and more frequent than Windows. remember it is updating everything (openoffice is especially large) and also no diff update (changes only) in most cases and the whole package is downloaded again. hopefully this changes but im sure people with big pipes dont care. I prefer Gnome actually but each to his own. Admittedly I haven’t tried KDE 4 since it has been stabilized (only the madness that was the early release) recently which I hear good things about but yeah that’s the great thing about Linux/FLOSS. Choice! To avoid any misconceptions, fragmentation of an HDD has a lot to do with the way it saves data–the filesystem. The disk gets “disorganized” which slows access and read & write times. While ntfs filesystems are prone to fragmentation, ext3/ext4 on the other hand require an HDD reserve cache to function properly. That’s why some distros will have you set a “swap” partition on the drive, typically 5-10% of your linux partition’s size. People should choose their OS based on their needs. There really isn’t a ‘do-all’ OS at the moment. I like the phrase: “You like the look? Well get your boots and black cap, they’ll match”. A nice outfit for a gay bar while typing away on your Macbook! Great. I dread the image of a typical Linux user. Hopefully not socks and sandals. Where is my ‘like’ button on here? You’ve been released from what house exactly? Take a break, will you? I find a lot of new users do complain about the relative difficulty of having completely up-to-date software in Ubuntu. Its a difficult thing to overcome having come from Windows where you find yourself constantly upgrading to the latest version of this or that program. As you are obviously interesting in computing and software etc you do want to have the latest version but it really isn’t all that necessary all the time as Ubuntu comes out every 6 months so you can stay relatively up to date. For instance many found it hard to upgrade to Firefox 3.5 mid release (when they released it) instead of just waiting a few months for Karmic which now includes it. Its a different mindset, I know and I’m not knocking the desire to be up-to-date all the time but if you can suppress your desire for this and just “use” the PC not “maintain” the PC all the time it makes for better computing. Hopefully Ubuntu will make it easier to add software direct from vendors etc but a lot of it is reliant on the vendors (Mozilla, Game makers etc) and their support of Ubuntu. Sounds good, but wrong. The Swap partition in Linux is simply a more efficient method of obtaining virtual memory–which Windows puts in a (normally) variably-sized file in the primary drive partition. That interferes with proper defragmentation and takes computer resources to manage. (I am not familiar with managing it in Vista/Win 7, but as of XP it always increased performance somewhat to make a fixed virtual memory size–and helped keep fragmentation in bounds as well). In fact, creating a separate partition to locate the virtual memory pool in Windows — very much like the Linux Swap — is an even better practice, but one rarely followed in Windows. With today’s large amounts of RAM, virtual memory is becoming far less necessary or even useful than it used to be when RAM was extremely limited and very expensive. NTFS is, compared to more modern filesystems, somewhat brain-dead…although far better than prior Windows filesystems. It is past time for Windows to at least implement a journaled filesystem, for example, especially in servers. @nosapm — You have your opinion about KDE, I and others have ours. However, today it is no more “bloated” than Gnome and has a much better programming model to boot. Both are far more bloated than some of the more efficient GUIs, though (although XFCE has been gaining considerable bloat in recent years and is often no better than Gnome or KDE). I have both Gnome and KDE on this machine, but I generally use KDE with the Enlightenment window manager as my preferred combination. Oh, yes–about Swap: It is plenty to set it approximately double the RAM size, as a very general rule–but once you get to multi-gigabyte RAM setups, the size of SWAP can be kept quite small. I run a 3 GB Swap partition currently; I will probably go with 2 GB on my next machine, regardless of the size of my Linux data partitions. I also keep my /home in a separate partition, and quite a bit larger than the primary OS partition. That way, I can do a version update or a reinstall of the system without touching the /home partition and its data. Very convenient. The idea of putting everything into the same data partition is not such a great one–but many former Windows users do it until they assimilate the very good reasons not to. It takes some time for users to understand how UNIX filesystems work–and that they can have primary directories such as /home on other partitions or even other physical drives while they appear in use as if they were on one. To be frank I do not like all the different flavours of Linux distros: too many choices of more or less the same. Ubuntu is very good and finally there is a distro like this what is trying in a professional way to bring Linux to the common man (like me). Opensuse is also very nice and Fedora is heading the right way. Nevertheless, since recently I have replaced Linux by Opensolaris. What is a utmost stable and pleasant OS. If Opensolaris is going to behave more a bit like Ubuntu I foresee a great competitor a head. Having too many choices is not a bug — it is a feature. It makes specialization possible. It makes variety possible. Why should we be limited to just one look, one feel, or the color we choose, “so long as it is black”? There are many users, many devices, and many applications, and users of open source software in particular, or ideas more generally, have the freedom — as in liberty — to build what they please. This model has proved to be an enduring one, whether for universities, for countries, or for software. [reply to David] David, the swap partition size matters if you want hibernation to work. In that case, it should at least be the size of the physical RAM. Another future benefit or purpose for swap is what I read recently about the possibility of giving the user at shutdown, the option to “save to resume”. When the user turns the computer later on, it boots by loading what it had saved previously, including applications, and in a few seconds. Of course there will be an option to bypass this path and boot the normal way. WINE abstracts the API — the system calls — of Win32, where as it doesn’t pretend to be a hardware architecture like, say, i386/amd64, presenting a machine instruction set. WINE is not an emulator. WINE is not a virtual machine. So you were half right. WINE does not duplicate the MS Windows operation system. Please don’t try to use Wikipedia as a way to try to prove something. Too many errors to be accepted as scientific research. As you said WINE does abstract the API-the system calls-of Win32, but WINE does not emulate the operating system as a whole. It just tries to do what needs to be done in order to get an application written for MS Windows to operate. Wikipedia has been investigated by the encyclopedia intelligencia and found to contain on average as many or often less factual errors than the established alternatives. Your comment is non-factual and unsubstantiated. I’d love to hear your explanation of “the operating system as a whole”. If it is not its API calls, seen from a userland perspective (which is all you’ll ever see — thus the term “imitation”), then I don’t know what it is. Linux is a bunch of system calls to me, since I’m not a Linux kernel hacker, and so is every other operating system on the planet. It’s a contract with the programmer (or the software hosted, if you will), a contract that is sometimes (unfortunately) breached. I’ll assume I can conclude that you have never touched a compiler? Next time you try to correct someone, make sure you’re not picking a target who deals with lexers, tokenizers and system design on a daily basis. And I still don’t care what the acronym stands for — it doesn’t change the fact that WINE *is* an emulator but *not* a virtual machine. Yes, I love Ubuntu. Everything just simlpy works with Ubuntu no messin arround for days. As for running Microsoft Windows Apps, I have found Sun’s opensource VirtualBox great. You simply run Microsoft Windows on top of Ubuntu, however with to long list of free programs available for Ubuntu there is very little need for Windows anymore. I use Windows XP, OpenSUSE 11.2, Fedora 12, Solaris 10 (10,09), and Ubuntu 9.10; all on the same harddrive in seperate partitions using grub and find Ubuntu by far the best. I just wish they would sell new HP notebooks with Ubuntu installed on them for less then Windows 7. I don’t need Windows 7. One thing that people needs to remember about Ubuntu is that Ubuntu tries to stay on the cutting edge as far as new software goes. It really depends on how you set up your repositories on how many updates you get or what is updated. If a person is more interested in stability then in the latest and greatest they may want to try a LTS version. (Ubuntu 10.04 will be a LTS edition). I know several who use LTS instead. Most of the time you will only get security updates. Of course how many or what kind of updates you get is always up to you, the user. It is also important to keep in mind that the software provided through Ubuntu’s repositories is not written by them; rather, it is written by a multitude of programmers who contribute to the many open source projects that exist. Ubuntu probably simply checks to see that a new release plays well with the environment that they’ve assembled. The frequency of software updates in Ubuntu has more to do with the scale of software development that has been made possible by the advent of the internet. @David- Thanks for the tip on downloading wicd! It definitely fixed the connectivity issue I was having. @Ashkay–I am glad it helped. One some systems, Network Manager works fine *except* with WEP encryption. On others, it is intermittant. On most of them, wicd simply works. The latest versions of KDE are excellent, and 4.4 (now in beta) is yet another improvement. The Gnome folks will go through the same “stuff” KDE did when it went to the 4.0 series when it in turn goes to 3.0…hopefully, though, they will have learned from the KDE experience and the transition may be a little smoother. For those transitioning from Windows, though, I believe KDE is a smoother change. In its default setup, it is more Windows-like–but it can be completely transformed in many ways to be a custom desktop if you wish.